This artist is one to be remembered! I felt so happy to see such a young artist. I am pulled in by the colors and strong feeling of First Nations history. It’s so good to see youth working in a cultural medium as a career choice. I have a business too and I know that any sale is a good one! I am proud of my business and I’m thrilled to see other young, First Nations entrepenuers getting their stuff out there! Good work! 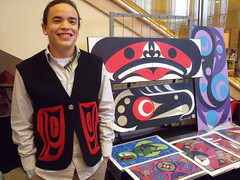 We are a group of First Nations youth from all around BC. We got together to bring you news about what’s going on in aboriginal politics, business, culture and communities. We are different because we are using cool new media like this blog to reach out to you and we really encourage you to get involved with us too! We are graduates of the Youth Information Technology team, a project funded by Indian and Northern Affairs Canada. Y-IT is administered by the First Nations Education Steering Committee (FNESC) and First Nations SchoolNet. Our team posts weekly on subjects that will interest you if you are an aboriginal youth, technology geek or someone looking to learn more about aboriginal events and politics. Check in with us weekly to follow us as we attend various events that will interest Aboriginal youth everywhere!